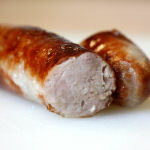 The Classic Pork remains a superb example of a properly made and presented traditional pork sausage. 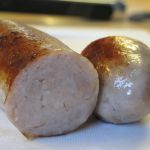 Jason Drage who runs the Churchgate Sausage Company based at Mayfield Farm (nr Sheeering) certainly knows his stuff when it comes to making sausages. 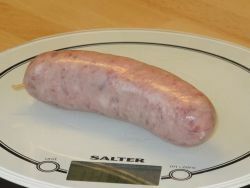 80%+ quality pork mixed with traditional flavouring ingredients loaded in to a nicely filled quality hog casing makes for a very good sausage. As for the taste when kept back and eaten cold, we still say very good! These are still one of Churchgate's best sellers and we can see why. Go buy some...you won't be disappointed! 110x30mm before cooking, 110x30mm after. That's a shrinkage of 0% & weight loss of approx 4%.